Professional and Business subscriptions enjoy unlimited workspaces with Redbooth. This allows you to create a workspace for each project or client, thus keeping all of their associated tasks cleanly organized. We recommend keeping no more than 600 active workspaces. You can archive any workspace once you no longer need it — it can always be unarchived later. A great way to keep confidentiality under wraps is by creating private workspaces. 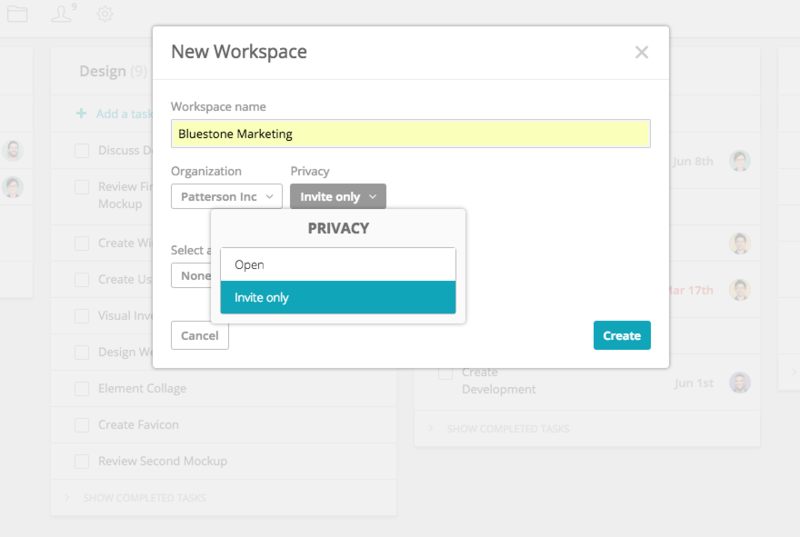 When creating a new workspace, just change the privacy setting to Invite only. 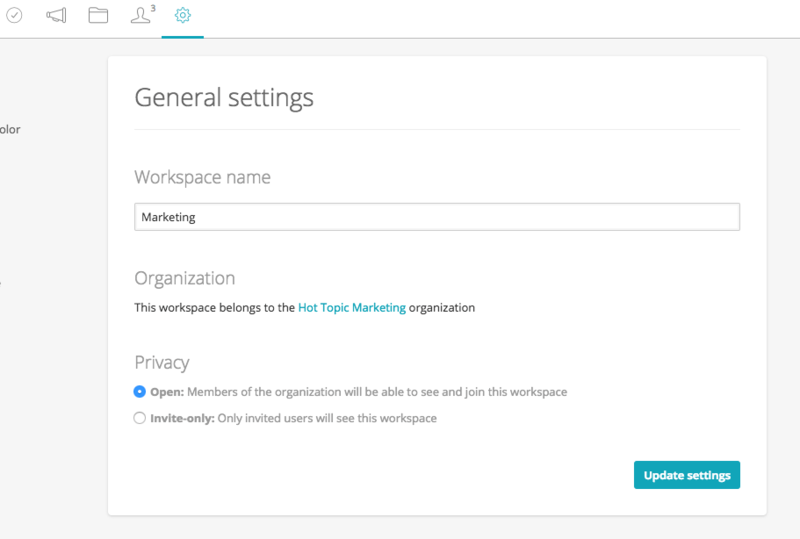 If you want to change an existing workspace from public to private then do so from the workspace settings. Keep a hard copy of your project by downloading the workspace. You can choose to download it as a CSV or XLSX file. Conversations, and files are not included in the download. They must be downloaded individually from their respective sections. Note that the date format for all downloaded and exported files is mm/dd/yyyy. You can read here how to customize it. Link your Redbooth workspace with a Cisco Spark room. Updates to all tasks tracked by Redbooth are then automatically added, in realtime, to the associated Cisco Spark room. Note that you need to be the organization admin or the workspace creator in order to set up the connection. 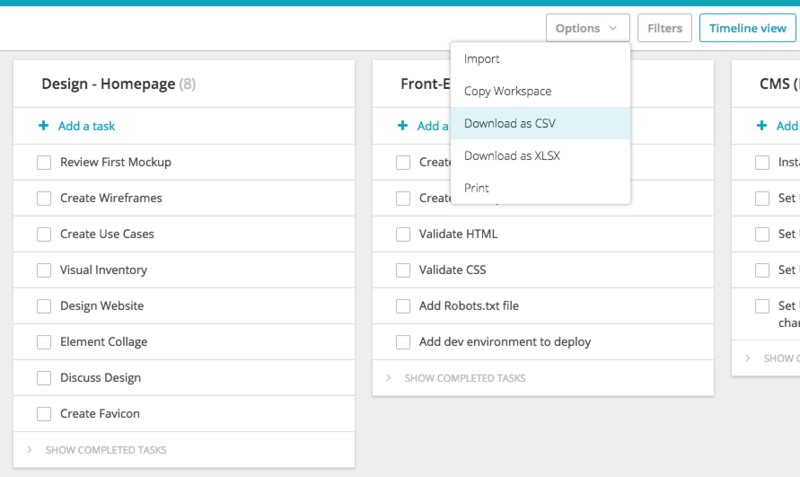 Create different templates to quickly implement recurring workflows. They can be used in any of your workspaces. Click on the Task List Templates tab. Click on the New task list template button. Create a template with a title. This is what you will see in the task list templates menu when you create a task list. Create any number of tasks. Each task can have a description which will be added under the task when it is created from the template. You can assign tasks to a specific team member or yourself along with due dates and followers. External members cannot see any saved task list templates. Enter your desired workspace and go to Add a new task list. Be sure to click on the Advanced options icon to the right. A new window will pop up and you can select the task list template from the drop-down menu. Choose your desired template, select the start and due date (optional), and then click Save. The task list will appear in your workspace and you can move its position by dragging and dropping.